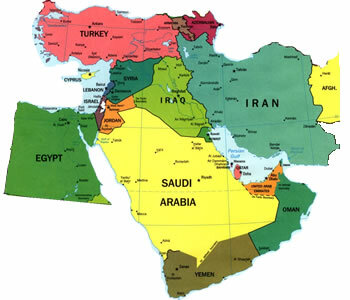 Turkey, Syria, Jordan, Iraq, Iran, Egypt, Lebanon, Israel, Saudi Arabia, and others. Baking, simmering, stewing, and fire roasting. Cucumbers, melons, leeks, onions, garlic, lentils, fava beans, garbanzo beans, olives, figs, grapes, dates, almonds, walnuts, hazelnuts, yogurt, quinces, honey, cinnamon, cloves, nutmeg, mace, cumin, coriander, fennel, aromatic long grain rice, dried and salted fish, cheeses, wine, pistachios, saffron, and citrus. Agriculture originated in the eastern world. Bread is first produced. Beer is first fermented. Yogurt is made. Three major religions and their dietary restrictions originate. The creation of the balance of sweet and sour. The stuffing of foods. The first honey soaked pastries. The Middle East is the birthplace of civilization so it is a good place to start my culinary adventure. Probably everyone has had some type of Middle Eastern food, kabobs, baba ghanoush, or falafels. It's very common, I frequently pick up this type of food in the take-out section of Whole Foods. A couple interesting things that I read is that bread is served at every meal, flatbread is used as a utensil, and rice and wheat make of the majority of their diet. The aromatic long grain rice that is used doesn't make it out of the country, here we use basmati rice. What did make it out of the country were some awesome pistachios though. A co-worker gave some to my husband, they are by far the best pistachios that I ever had. I wish that I could find them here. For this adventure I decided to visit a market, try a restaurant, and cook a few dishes. I visited a couple Middle Eastern markets in my area and think that Setareh Market in San Jose was the best. We bought a few things to try. We ate the flat bread and baklava, the tahaini and harissa will be finding their way into dishes soon. I went to Falafel's Drive-In in San Jose for my restaurant selection. This was a fun place! It was a sunny and warm January afternoon, we ordered a falafel sandwich, chicken in a pita, hummus plate, pita chips, and onion rings. Okay so I'm not sure that the onions rings are really Middle Eastern, but I couldn't pass them up. Everything was tasty, I would eat here again. For my dishes I decided to make Egyptian Chicken, and Hummus with Whole Wheat Flatbreads. Recipes for Middle Eastern cuisine can be found here. I am always adding more, so check back!